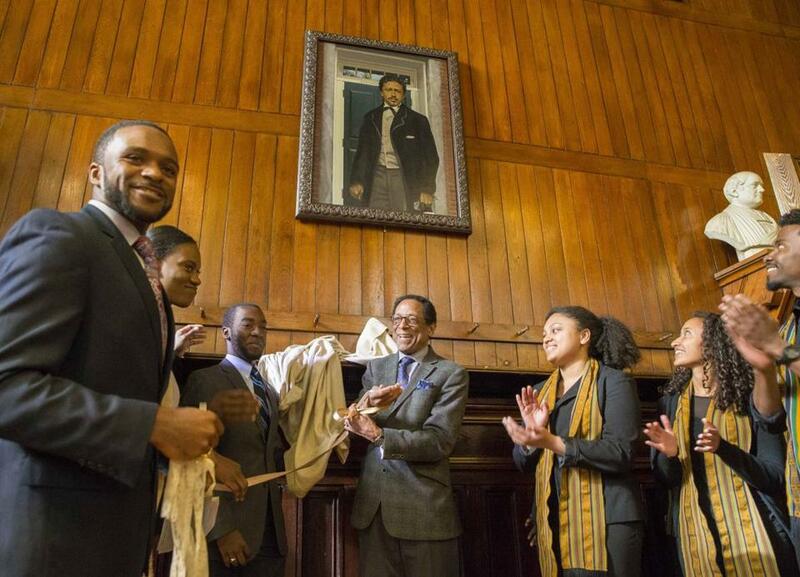 Dr. S. Allen Counter (center), of the Harvard Foundation, unveils the portrait of Richard Theodore Greener. A portrait of Richard Theodore Greener, the first African-American graduate of Harvard, has been unveiled and added to the Harvard Foundation’s portraiture collection. (There are now 16 portraits of exceptional grads in the collection.) Commissioned in 2014, the portrait of Greener, who graduated from Harvard in 1870, was painted by Steve Coit and will hang in Annenberg Hall along with a painting of Caleb Cheeshahteaumuck, the first Native American to graduate from Harvard in 1665. Greener won the Bowden prize for elocution in his sophomore and senior years at Harvard. He went on to teach at the University of South Carolina, where he later earned a law degree. He served as a diplomat in the administrations of presidents William McKinley and Theodore Roosevelt.